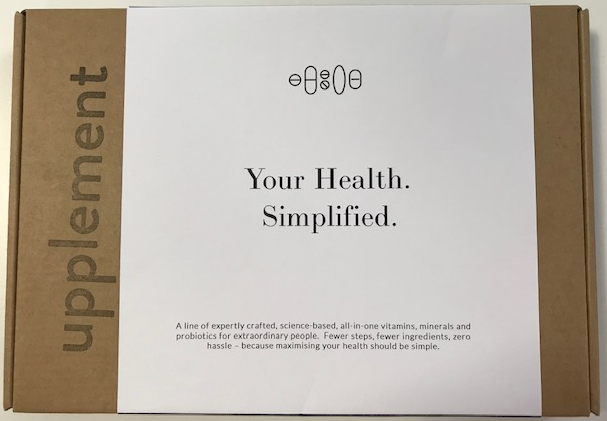 Upplement Essential Protocol is a monthly delivery of science-based, all-in-one daily vitamins, minerals and probiotics that are delivered to your door to help you maintain and maximise your health and wellbeing. This week, our digital marketing exec, Katie, reviews this supplements box for us. "The idea for Upplement was born when Founder, Joey, visited his local health store following an illness which stripped him of essential nutrients. There, he found himself laden with different sachets, tablets and chews and was unsure where to begin. The concept of delivering the vital nutrients needed to maintain health in a simple, easy monthly box was the driving force being the Upplement subscription, taking the confusion away from the customer by delivering them precisely what they need. So, if you battle with a few sluggish days a month or would like to reduce increasing levels of stress, then Upplement might be the box for you. The size of the box is relatively small (it fits comfortably through a medium sized letterbox) and the design is entirely fuss-free. The back of the box details exactly what’s inside with a breakdown of the vitamins, minerals and more listed out in an easy-to-read format, so it’s clear to see what you’re getting in each parcel. I like how simple the branding is, it really reinforces the box’s emphasis on simplicity, and I love how hassle-free everything seems. When inside the box, the pills are split into separate mini silver sachets, one for each day of the month, which makes for an incredibly easy monthly vitamin fix, no faffing around with different bottles or sachets. Each sachet has four products inside, including multivitamin and minerals, Vitamin D, high-strength Omega-3 and Probiotics. There are thirty sachets inside each box to keep you covered for a month, with each subsequent month delivering the same supplements. It’s comforting to know that taking Essential Protocol every day will give my body access to the essential nutrients it needs to improve my immunity and maintain energy. It’s easy to pop the sachet in your bag too so if you prefer taking your vitamins with your breakfast at work you can do that without having to decant everything into a separate container or bag. As well as the Essential Protocol box I subscribe to; there are three other variations to choose from; Balance Protocol for reducing stress and anxiety, Brain Protocol for boosting brain function and Beauty Protocol for boosting beauty, health and wellbeing - so you can choose whichever option best suits your needs. What’s more, and my favourite thing about this subscription box, is that Upplement has partnered with Vitamin Angels so for each Protocol box sold, a child in need will receive life-changing vitamins for an entire year which I think is excellent and a definite selling point for me. The Essential Protocol box is £24.99 for a 30-day supply of supplements and typically dispatches one day after the order is placed. The ease of the daily packets and getting essential vitamins and minerals delivered to my door makes the £25 seem entirely justifiable, vitamins can be quite expensive in any case, so I’m more than happy to pay this amount. I also love the fact I don’t have to scour the health food shop in town or spend hours googling different Omega 3 pills; it’s all sorted for me. Not only is this a great idea if you’re feeling a little sluggish yourself, but it makes a thoughtful gift to any friend who might be going through a rough patch and is in need of a little inside glow. It’s so important to take care of yourself from the inside out, and this is a really great place to start. Whether it’s a placebo effect or not, I feel a lot better and more energised after my first month of supplements, which is fantastic. Knowing that my body is getting the essential nutrients it needs to battle against the impact of environmental pollution, stress, low energy levels, digestive issues and many other conditions makes me feel healthier and has inspired me to eat better too! Your body is an incredible thing so making sure it gets everything it needs to function correctly from the inside out is of paramount importance. I would recommend the Upplement Essential Protocol to anybody looking to revitalise themselves and lead a healthier lifestyle, with minimal effort required." Stimulate your general health and wellness with a monthly dose of essential vitamins from Upplement Essential Protocol. Shop yours today with uOpen!